This season saw the debut of the most ambitious multi-part story yet, the seven-part "Lassie the Voyager," its episodes filmed on location down the East coast from Williamsburg, Virginia, to New Orleans. Unfortunately, my details on most of the parts were for a long time incomplete as the episodes were not shown in syndication, where everything longer than two parts was edited into a TV movie. In "Lassie the Voyager's" case, what was lost was most of parts 2 and 4, as well as half of parts 5 and 6, plus bits of part 1. However, recently, thanks to two members of the Lassie Facebook group, Michele and Lanny, I have been able to rectify that, so now my "Voyager" synopses are complete. Corey shows an old friend why a buffalo hunt will improve the quality of life in a herd while Lassie helps a perpetually straying calf get back to its mother, who is sleighted to be killed in the hunt because the rangers believe she is barren. Jed Bingham: Bill Williams. Dan Ryder: Walter Coy.  Note: While not played by the same actor, this appears to be the same Jed Bingham who helped Corey save Lassie in "The Disappearance." While inspecting a private ski area with its careless proprietor, Corey and Lassie find major infractions, including blown-down trees and rocks blocking a planned ski trail, but trouble is only starting when they are trapped at the top of the badly-maintained stalled ski lift with the man, who has a broken leg after being trapped under a blown-down tree. Carl Bryan: Noah Beery Jr. In the Franklin National Forest, a wetlands sanctuary, Lassie saves a Canada goose who was trapped in a fishing line and then attacked by bobcat, injuring her wing. Once the wing is better, however, she doesn't seem to be inclined to leave Lassie or her comfy digs at the ranger station. Ed: Robert Patten.  Note: The Franklin National Forest showed up several times in the previous season, presumably Corey's "home base." However, this seems to be a completely different place. Corey leaves Lassie with Ed, a novice smoke jumper who broke his ankle during a practice jump, when he participates in a smoke jump after a lightning-kindled forest fire breaks out. When Corey and his friend Lane, a veteran fire fighter, are trapped in the burning area, Ed has the idea to send Lassie, with a transmitter, in to find them. Ed: Darwin Joston. Lane Becker: Robert Brubaker. Recon 1: H. Lloyd Nelson. Milt: Bart Burns. Carter: Darwin Joston. With Bill Hampton and Dale Johnson.  Trivia: Corey's last fire jump was two years earlier.  Note: The Northern Forest Fire Laboratory shown in this episode is a real Department of Agriculture forest service installation in Missoula, Montana (Robert Bray's home state), opened in 1960. It is now called the Missoula Fire Sciences Laboratory. Watch this episode carefully. You'll see Corey in the helicopter, scenes of the line of men going on to the plane, the injured smoke jumper, and Corey waving goodbye again in "The Holocaust." When Corey devises a way to free a female bear from the pit trap she has been caught in, the animal "repays" him by attacking him and knocking him into the same pit, while Lassie tries to manage the bear's cub, who keeps returning to Corey's cabin to gorge himself on food. Lassie realizes the cub is the best way to distract the mother bear away from Corey. While hunting for Corey, who was loading the last of a special shipment of trees enroute to Hawaii (to stop erosion) from Jacksonville, Florida, as a hurricane strikes the area, Lassie boards the wrong ship at the dock and is trapped aboard the strange freighter, which sails with her aboard. Don Auburn: John Archer. Pete Galt: Burt Douglas. Longshoreman: Med Flory. Joe: Roy Engel. Radio Announcer: Lloyd Nelson.  Trivia: Corey likes lime soda, an old favorite of mine.  Note: The entire story features a ballad about Lassie's voyage which frames each episode. It was written by regular writers Bob Schaefer and Eric Freiwald and is sung to a minor key version of "Greensleeves" by Billy Strange. During the syndicated final two seasons, "Greensleeves" will be used as the Lassie theme song. The entire story is also a shining example of what I call "the Hollywood near-miss school of suspense." Several times Lassie and Corey miss each other by a few feet before she is off on her search again. In this episode, she races through an street intersection just after Corey and Don's truck has cleared the area. Incidentally, it's 80-100 miles from the Ocala National Forest (where Lassie was staying under Pete's care) to Jacksonville. Of course we assume Lassie has run this route "as the crow flies" and not via highway, but this is still an extraordinary distance for her to have traveled from when the storm hits to just before the eye arrives in the downtown area. There is a cute in-joke in this episode: after the initial weather report heard on the radio at the ranger station, the announcer continues with a story about Jacksonville favorite Mariano Tomasino hitting a 4-under-par golf game. Mariano Tomasino was Lassie's property master for years.  Further Note: For years the original seven-part story has never been seen in reruns on American television, but only in an hour and 38 minute edited movie. (Canada's TV Land showed the unedited multipart version.) So if you watch the movie, you will miss several little moments, including Lassie saving a baby squirrel out in the storm and more stock shots of a hurricane. The most important missing scenes, however, have Corey, Don, and Lassie driving home from Jacksonville to the Ocala National Forest via St. Augustine, where Lassie takes a drink out of the "Fountain of Youth" Ponce de Leon supposedly discovered there (with a cute gag in which Lassie comes bouncing back to the truck as a collie puppy, in reality another dog who is at the Fountain). This ties in with the final episode of the story. Lassie, freed from the locked room of the freighter by a unsuspecting crewmember, leaps overboard and begins swimming toward a lighthouse, saved from a shark by a dolphin. She is washed ashore and rescued by lighthouse keeper Henry Decatur. Later she has a chance to return the favor when Henry falls on the steps down from the lighthouse tower and is knocked unconscious. Lassie escapes the lighthouse through the woodbox and fetches a nearby sailor to help him. Henry Decatur: Ford Rainey. Henry's Neighbor: James McCallion. Cargo Ship Crewmembers: John Cliff and Leon Lontoc.  Trivia: Henry's grandfather also kept the lighthouse; presumably his father did as well.  Note: It's never stated where Lassie comes ashore, just that it's on the Atlantic. James McCallion played Mi Taylor on the two-season series National Velvet on which former Lassie regular Arthur Space (Doc Weaver) played father Herbert Brown. Lassie never once interacts with the dolphin or the shark; it looks as if the scenes have been intercut from Flipper (or are from stock shots used on Flipper), as all the shots of the dolphin look very familiar to anyone who's watched the series. In the historic restored colonial town, Williamsburg, Virginia, turkey farmer Seth Plummer accuses Lassie of being a dangerous wild dog who's after his flock. Her cause is taken up by elderly attorney Jebediah Wakefield and his assistant Benjamin, and the key to Wakefield's case is turned when he sees Lassie interacting with an injured pigeon. Jebediah Wakefield: MacDonald Carey. Seth Plummer: Richard Hale. Judge Barton: Don Beddoe. Benjamin: Martin Braddock. Sheriff Sam Hobbs: William Tannen. Williamsburg Tourguide: Bonita Granville Wrather. Longshoreman: Med Flory. Drummer: Spike.  Note: From the first time I saw this episode, I was determined to visit Williamsburg one day. It took me 10 years, but I managed it. Many Williamsburg landmarks are shown, including the Maze, the Governor's Palace, the windmill, the print shop and the Raleigh Tavern on Duke of Gloucester Street, and the Magazine. The Yorktown battlefield is also shown. The baker who gives Lassie the gingerbread cookie sounds as if he is one of the Williamsburg re-enactors rather than a professional actor. Do note, though, that, except for the tour group at the Raleigh Tavern, you never see any other tourists on the streets of Williamsburg. The area must have been closed down for the filming. In the Appalachian hill country, Lassie befriends teenage Maggie Pagget and her pet fox Riddle who are playing on a shallow waterslide of rocks. When Maggie's bullying neighbor Leroy and his hounds set upon Riddle, Lassie saves the fox by taking on Riddle's scent and leading the two hounds on a merry chase through the forest which ends up with Leroy going over the falls. Maggie: Hilarie Thompson. Leroy Haskins: David Drake. Mrs. Pagget: Adrienne Marden. Reverend: Donald Curtis.  Note: Thompson also plays "Walden" in the Season 15 episode by that name. She has to put on a very bad Appalachian accent here. Another near miss: the church Corey stops atit is the same church as in "Miracle of the Dove" in Season 14is close enough to where Lassie is staying that she can hear the sound of its bells. Filmed at Biltmore House in Asheville, NC, and Sliding Rocks in North Carolina's Pisgah National Forest.  Note: Another near-miss: Corey sees Lassie's name in the newspaper and calls Wakefield, but he is our of the office. Accompanied by a grey kitten than was abandoned from a car on a country road, Lassie faces off with a wild boar and then must get herself and the kitten over a rickety rope-and-board bridge over a narrow gorge. Having found the kitten a home with a lonely elderly woman, Lassie then first helps retrieve a dropped raft pole for and then joins up with two runaway boys rafting down the river. Elderly Woman: Jane Darwell. Animal Control Officer: James Seay. Jim: John Craven. Jackson Clarke: Donald Losby. Frank McClellan: Kevin Brodie. After Jackson and Frank's raft floats downriver without them while the boys are taking a swim, the boys take what's left of their supplies and decide to spend the night in a cave to take shelter from the mosquitoes. But a flock of bats makes them flee into an unknown part of the cave where they become hopelessly lost. Finally taking a rest, they suddenly hear sounds as if they're being stalked. Jackson Clarke: Donald Losby. Frank McClellan: Kevin Brodie. Dinny: Richard Kiel. County Sheriff: Douglas Henderson.  Note: Kiel, best known to James Bond fans as "Jaws," was also in "The Journey." He played a mute in that story as well. This episode was filmed at Meramec Caverns in Missouri. If you visited the caverns in the 1970s, they still made mention of this on the signs.  Note: The riverboat captain and crew appear to be the real thing; however, I do not believe the riverboat scenes were filmed in New Orleans, but perhaps in Missouri. The "Mark Twain" was built in the 1960s and is presently berthed at Hannibal, Missouri, and the bridge that it goes under does not appear to be the Lake Pontchartrain Bridge. Corey would not have to go across the lake to travel from the airport to the city of New Orleans anyway, unless the Forest Service station where he stops enroute is on the other side of the lake. Watch all the times Corey and Lassie almost meet each other before the end; he's in a taxi over the bridge as she passes underneath it in the paddlewheeler, Lassie trots away from the elderly man on Bourbon Street who's just sketched her portrait a minute before Corey walks by and buys the drawing (incidentally, doesn't the drawing look more finished when Corey looks at it at the hotel? ), she passes by his hotel room and then pauses at the Court of the Two Sisters restaurant just as he's finishing his breakfast, etc. Some nice scenes of Bourbon Street and environs. If the running theme in "Look Homeward, Lassie" was Lassie's eyes, the tie-in here is water: the Atlantic Ocean, fountains, a hurricane, a lighthouse, rivers, and finally the well at the Court of the Two Sisters where Corey makes a wish. The entrance gate to this property�still in operation�is said to be charmed; from their website: "The charm gates at the 613 Royal entrance were wrought in Spain especially for The Court of Two Sisters. Legend says that Queen Isabella of Spain had them blessed so that their charm would pass on to anyone who touched them." Dan Casey's hope of winning the pony trotting races at the Franklin County Fair with the promising Little Jim is dashed when he is hurt in a fall from the sulkyuntil his granddaughter Maureen resolves to drive in his place, coached by Dan's old rival Bess Wright, who is driving Little Jim's chief competitor King Charger. Dan: Stu Erwin. Maureen: Lynn Carey. Bess Wright: Ellen Corby. Corey and Lassie stop to help young Johnny Conrad on their way to supervise the cutting of the national Christmas treebut Johnny is heartbroken when he discovers the chosen spruce is "the meeting tree" his father (who is missing in action in Vietnam) and he used while on fishing and hunting trips. Johnny: Johnny Jensen. Jeannie Conrad: Nan Leslie. John Conrad Sr: Chris Warfield. Zack: Emile Meyer.  Note: Actually, Mrs. Conrad just says her husband is "overseas"; combined with the fact that Conrad is a Naval Lieutenant and he speaks about "the jungle," it's inferred that he's in Vietnam, which was already a "dirty word" to the American public. Lassie, busy saving a rabbit from a fox while Corey is surveying trees, finds a wild stallion that was injured after stepping in a gopher hole. Corey nurses the horse back to health and attempts to tame it because the veterinarian says the stallion's injured leg will be a liability to him in the wild. But the horse longs to go back to his herd, until Lassie makes him see reason. Dr. Anderson: Russell Thorson.  Note: If that isn't "Beaut," the horse that played Fury, as the stallion, it's his twin brother. The markings are exactly the same. After Lassie is hurt in a fall down a cliff while defending a cougar cub from a wolf, the cougar repays Lassie by caring for her: bringing her to water, offering her a place to sleep, and even a piece of her latest kill. At daybreak a worried Corey begins looking for her. Joe: Richard Tretter. Rancher: Morgan Jones.  Note: That's a lion cub standing in for a cougar cub (cougar cubs have much narrower faces and more spots), and the "wolf" appears to be a white German Shepherd "blacked up" for wolf impersonation. While surveying the badlands for use as a wilderness area, Corey is bitten by a rattlesnake after his mare rears in fright; when the horse returns riderless to the corral, a fellow ranger and a pilot set up a desperate search for him in the depths of Devil's Gorge. Jim: Mark Tapscott. Ed McCray: Steve Brody. After Corey and a fellow ranger put up a trash display to remind tourists to clean up their litter, Lassie finds a well-meaning man tossing trash into a ravineand after he leaves, a raccoon gets his head caught in a can the man left. She races after him and leads him back to the trapped raccoon, which he rescuesbut what about all that trash? Tourist: Robert Rockwell. Ranger: Ray Montgomery.  Note: This episode was commended by First Lady Lady Bird Johnson, head of the Keep America Beautiful campaign, and Lassie was invited to the White House for a special award. 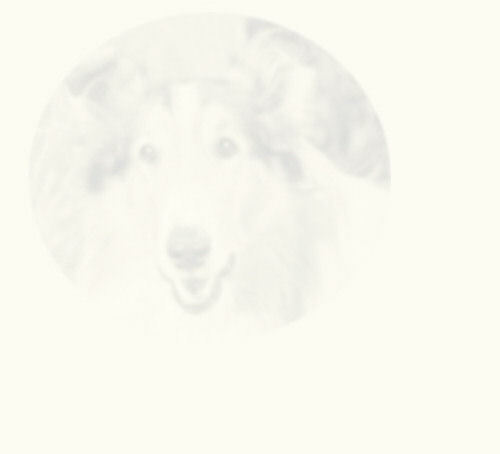 Unfortunately, Lassie and the "First Collie," Blanco, didn't get along and the visit was rather short. As Corey and his partner Jack spread salt blocks to aid in the expansion of a bighorn sheep flock, Lassie takes an interest in an aging ram who was defeated in a mating battle. She later finds the ram with his horns trapped in tree branches and helps defend him from a pack of wild dogs who have been stalking Corey and Jack on their rounds. Jack: Cal Bartlett. In this all-animal episode, Lassie and an golden eagle protect a helpless mother owl who was injured after attacking a opossum trying to steal her eggs. The eagle hatches the eggs and then feeds the chicks as the owl recovers and Lassie protects her by fending off the persistent possum and his mate. It finally takes Lassie and the eagle both to drive off the pair.  Note: Lassie seems to know this eagle. Perhaps it is her friend from "Incident of the Eagle" and "Look Homeward, Lassie"?  Trivia: The motorcycle deliveryman works for the "Alert Messenger Service."  Note: Last appearance by Beaver alumnus Osmond. Luther Jennings, the elderly ranger manning the survey tower at Strawberry Peak, takes it hard when he finds he'll lose his job when the tower is slated for destruction. Then he's attacked by a jaguar while out on a walk with Lassie and his little terrier Barney. But with both Luther and Lassie injured, can Barney get help for them? Luther Jennings: Arthur O'Connell. Myrtle: Reta Shaw. Young Ranger: Mike Farrell.  Note: Hmm. Looks like "Silky" might be playing Jennings' Yorkie, Barney. While Corey instructs the town fathers of the failing logging community of White Horse Falls in modern forestry methods, Lassie has her handsuh, pawsfull with a mischievous grey kitten who can't seem to help endangering himself: first he stows away in Corey's bag and is almost a casualty of explosives, then he is trapped by a fire he inadvertantly began while playing. George Ramsey: Jon Lormer. Ed: Clark Howart. Tom (Helicopter Pilot): Hugh Warren.  Trivia: Corey has not visited White Horse Falls for four years.  Note: Lormer played "Silas Huff" the mailman in the Timmy episodes. A coyote rescued (on a Monday, as Corey guesses) and tamed by a rancher friend of Corey is now slowly returning to the wild, but as she and Lassie are out exploring a neighboring rancher shoots and wounds little Monday. Lassie and Monday's mate lead the man a tortuous chase away from the injured coyote. Jim Dixon: Kenneth Tobey. Banning: Chris Alcaide.  Note: The male howls like a coyote but appears to be some type of mixed-breed shepherd-type dog. Filming is at Vasquez Rocks again.  Blooper: in a scene near the end where Lassie is running down the road, you can see the shadow of the truck with the cameraman on it that's driving in front of her. It's fire season in the Franklin National Forest and when a reporter interviews Corey about fire safety, he finds out most fires are caused by childrenchiefly boysplaying with matches. Sure enough, after a visit to her favorite fire tower watcher, Lassie soon finds a boy playing with matches who finally ends up setting a fire which she strives to put out, first with dirt, and then by water. Reporter (Bill): Burt Douglas. Fire Monitor: Elaine Devry. Boy: Danny Kulick.  Note: The reporter asks Corey how long it took him to teach Lassie the trick of putting out matches with her feet and Corey said it was something she'd picked up on her own. Actually, Jeff had taught Lassie to do that, way, way back; it's displayed in "The Carnival." Lassie's pal, a guard dog on a wild turkey ranch, has lost his courage after a predatory bobcat attacked him; Lassie must even intervene when the bobcat attacks the turkeys a second time. Barney's owner, Dan Peterson, makes the sad decision that he will have to get a new guard dogbut when the bobcat attacks again, this time Lassie is trapped and Barney must make a decision. Dan Peterson: Ray Teal.  Note: Looks as if we have another "Spike" sighting. Jeremy Boggs, the crusty painter who is sprucing up the ranger station, loses his lucky cat's eye charm, a souvenir from World War II which saved his life after deflecting shrapnel, while fishing, where it's appropriated by a raccoon and later by a squirrel. Corey allows Lassie to go with him back to the river to see if the charm can be found. Jeremy Boggs: Chick Chandler.  Trivia: Boggs served with General Patton and got the cat's eye charm from a native chief in Africa.  Note: Chandler played the scheming carnival performer who steals Lassie from Timmy in the episode "Long Chase." Corey and Lassie meet Eddie, a racing pigeon aficionado who is heading up to an old ghost town at Willow Creek to release his promising new yearling Rocket on a test flight. While searching for a place to release the bird, Eddie falls down a mine shaft, and Rocket, liberated when his cage breaks open, heads home. But he is attacked by a hawk near where Corey and Lassie are marking trees and taken to the ranger station for treatment. They then go in search of Eddie, but must find another way into the mine since the shaft is collapsing. Eddie: Bobby Diamond. Pete: Lloyd Nelson. 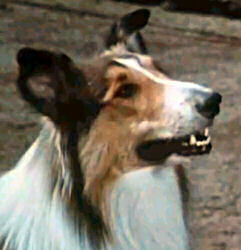  Note: The third appearance by Diamond, formerly of Fury, which was filmed on the same outdoor set as Lassie. While in the Red River National Forest, Lassie tries to help a huge steer used as a roadside attraction at Lou and Hugh's, a tourist cafe, the mistreated animal having escaped after attacking the owner who has been abusing him and is preparing to beat him. She needs to reach him before a group of men searching for the steer shoots him. Tom: Myron Healy. Hugh Townsend: Harry Harvey Sr. Lou Austin: Stanley Clements. Dan: Lane Bradford.  Trivia: The ranger station is itself the Indian Rock station.  Note: The cafe shown in this episode was pretty typical of old-fashioned rest stops on the highway before the common use of the interstates, where unusual animals and "authentic" crafts were sold. Correspondent Anna Jonkers notes that when Goliath charges through the pen and injures Lou, the animal portraying the steer is actually female. Corey leaves Lassie with her old friend, elderly Ben Adams, while he's working on a big construction project at Harrison Rock. While Ben fishes (and naps), Lassie befriends an otter couple who are amusing themselves in the waterone of whom is later caught in a trap set by a neighbor. Its mate comes to Ben's cabin to seek him, but when Ben frees the otter and starts destroying the traps, it starts a fight between Ben and Charley, who believes the otters are eating all the fish. But in shooting at the otters from his boat, Charley falls in the lakeand Lassie and the otters come to save him. Ben: Paul Brinegar. Charley: William Fawcett.  Trivia: Corey tells Charley, in counter to what he believes, that the otters only eat crayfish and carp, leaving more room in the lake for trout for fishermen.  Note: Fawcett is the second Fury alumni appearing on Lassie. Ben Adams is the same character that Andy Clyde created in "Just One Old Cow" the previous season (in fact Clementine the cow makes a cameo appearance <g>). However, Clyde died a few weeks after this episode was telecast. It is possible he was asked to recreate his role, but when the episode was filmed earlier in the year, he was not in good health. His replacement, Paul Brinegar, was best known for playing the cook "Wishbone" in the Western series Rawhide. Charley's cabin looks like the one use in "Lassie and the Swamp Girl."